Name : StackThatMoney or STM Forum. Price : $ 99 per month. Owners : The website lists the Masterminds behind StackThatMoney as Lorenzo Green and Dr. Charles Ngo. Overall Rank : 90 out of 100.
Who it’s for : Intermediate and Advanced Marketers. StackThatMoney is a members-only forum for all things related to Internet Marketing.It was started in 2010 and launched its’ private forums in 2011. It actually has loads of information that is educational and informative in the field of Internet Marketing,however, for someone new to the business, it most likely will be overwhelming in its’ content.There are very successful people who are members and they are willing to share their experiences within the forum threads. The overall feel of the website is energetic and constructive, as well as appearing to be helpful and outgoing. If you are visiting my website for the first time you are most likely a beginner to Internet Marketing, and this is not a website that I would recommend to you to start learning the fundamentals of IM. The high monthly fee is also a reason that I wouldn’t suggest it for a beginner. It’s not that STM doesn’t provide value for the money, it’s simply that newbies need to focus on other things at this stage of their education. My main goal of reviewing it is that as you do your own research, you may very well run into this website and get lured into paying to become a member, only to realize that you weren’t ready for the level of information provided.That can be discouraging, and someone new to IM needs to keep a positive attitude as they learn the fundamentals. OK, so I’ve already mentioned that I don’t recommend STM Forum for anyone new to IM, also known as AM-Affiliate Marketing, but one of the things I like about STM is that anyone can go to the website and preview what it has to offer for free. When you get to the preview page there is a section called The Newbie Zone that allows you to see partial segments of some of some of the recent posts, along with the prompt to join as a paying member. I feel that they call it The Newbie Zone for anyone that has not joined yet, not necessarily for someone completely new to the subject, but either way, people do have the option of checking it out first to see if it fits their needs. Another good thing about STM is that there are people who have been successful in their Marketing campaigns posting on the Forum to the benefit of the other members. These members have been doing this for years, and they know what works and what doesn’t, once you get to this level of experience in Affiliate Marketing. As a result of so many successful members posting on the Forum, there is an abundance of useful and educational information related to Affiliate Marketing and its’ related subjects. Tutorials in advanced and complex Marketing subjects are also available to members, as well as posts called Follow Along threads. Follow Alongs are posts submitted by members describing certain procedures that they are doing in a certain niche or on a certain website to give you a more focused picture of what you could do in a similar vein.These are for guidance only, and these posts should never be plagiarized. I’m not getting paid to say this, it’s just my opinion, but there are only a couple of negative things I would say about STM Forum. One is the price.Anyone new to Affiliate Marketing is trying to control costs as they learn the fundamentals. Another thing is that although there is so much available to learn here, it’s still not appropriate for beginners looking for information on website building, content creation, or niche selection techniques. StackThatMoney Forum is for Intermediate to Advanced Marketers who are beyond the fundamentals stage.If you are a complete newbie, keep this website in mind when you have already built one or more established websites, and you want to take your education to a higher level. called The Affiliate Mastery Challenge, which is a very in-depth training program, however it will set you back $2,997 if you are a member. Some tools available at STM are FunnelFlux, which is a visual tracker to monitor information about your campaigns and your websites, and another one is called AdPlexity, which is an ad monitoring service for mobile or desktop use. Very useful tools, but also expensive. STM Forum support comes from within the community and through e-mail to the support team. The price for membership is $99 per month. 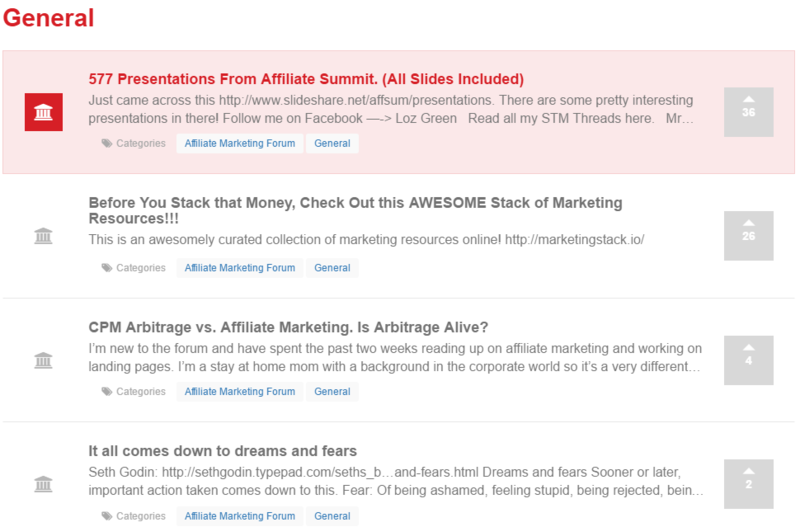 I think STM Forum is a legitimate and reliable source of information and education in the field of Affiliate Marketing. It fills the needs of Intermediate to Advanced Marketers extremely well, and they do this on a global scale. It may not be appropriate for all niches because some of the traffic sources they recommend are Adult Content and PPV. I also would advise complete newbies to avoid this site until they have achieved a level of success that would justify the expenses involved with membership in STM Forum. Well it was nice to read that Stack That Money, STM, is a legitimate opportunity and that anyone can view what they offer for free. The problem with many make money from home opportunities in online marketing is that they do not show up front what is free. That being said I think the monthly price is a bit high, but if what they offer is quality then I think it is justified. However that price for the Affiliate Mastery Challenge is way too much money, especially when you can learn everything about affiliate marketing for a fraction of the price elsewhere online. Thank you for your comments Robert. I agree with you that STM Forum is expensive, and as you said , you can learn the same material for far less money from other sources online. The goal of my review was to provide enough information for my readers so that they can make a decision about what is best for them, and to highlight the fact that it’s not necessary to spend so much money to learn the fundamentals of Affiliate Marketing.